The Center for Science in the Public Interest, sometimes referred to as the “food police,” is the advocacy group we love to hate. In reality, they do mountains of good in heightening public awareness about healthy eating—by telling us the ugly truth about our favorite indulgences, from buttered popcorn to Mexican food. Call it the curse of the word nymph, but what made me take notice was not the data but the delivery. A word nymph can detect a mixed metaphor faster than a wood nymph can spot a bull thistle. I’d say, technically, the answer could be both, but not in the same sentence. What’s the difference? The first originates from “flying below the radar,” which is to go undetected or unnoticed. 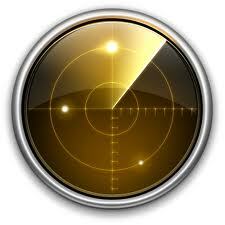 To be on someone’s radar screen is to receive his or her attention. To be off a person’s radar screen means the person is unaware. The difference in meaning is extremely subtle, so perhaps I niggle. And yet, hearing the mixed metaphor on the news last night left me with a messy mental image. When Ms. Smith DeWaal said that outbreaks are “slipping under the radar screen,” I immediately wanted to swab the radar screen, and the control panel below it, with an antibacterial wipe. Did anyone else have the same gut reaction? I had a similar image. I was also trying not to over-niggle at consumer/they. BTW, I am really enjoying your blog. Thanks; right back atcha! Thanks for adding it to your blogroll, too. I’m waiting for you to tackle ‘kicking the can down the road’. But, have fun with mixed metaphors aplenty, in the meantime. On the serious matter, NPR had a good discussion yesterday on food allergies.